Yes I've finally finished one of my projects. 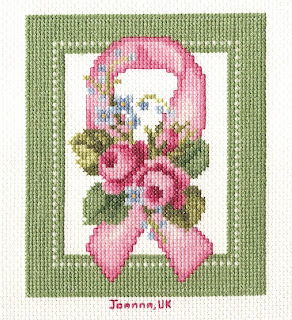 This was the square for Quilts for Breast Cancer, its one of EMS designs and I took a shine to it as soon as I saw it on her website. It took longer than I planned to stitch but that was due to the border, I was going to leave it off but when I'd finished the square and saw how much it set the BC ribbon off am glad I stitched it now. It was touch and go as to whether I'd finish it or not as I was running out of the green and our local Hobbycraft had run out...luckily I managed to finish the whole border with just 1.5" left of thread. This weekend I've finally started the A Stitch A Week SAL with friends from Friendly Stitches. Designed by Abi I've been wanting to join in since I first saw it but needed to finish at least one project first. Abi has designed some fantastic motifs for inside the grid, BIG Thank You to Abi. Got round to buying the linen and started the grid, not been easy as our daughter is teething so everytime I picked up my stitching she woke up crying. Feels weird sewing on linen again as I've used aida for the past 6mths due to the projects I've been working on. This SAL uses not just cross stitch but speciality stitches as well so it'll be a lovely change as I haven't had much chance to do some proper embroidery stitches since last Christmas. Every so often I'll post a picture to show you how its going. wow - lovely finish Jo - the border really does set if off. What a lovely finish for breast cancer awareness. Definitely the prettiest one I have ever seen. Great Job!